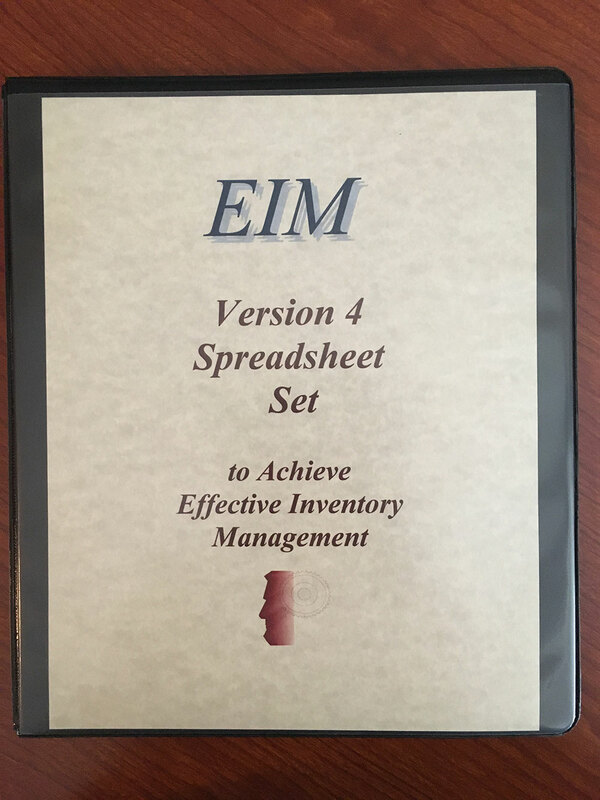 EIM Version 4 Spreadsheets are an exciting tool that implements the principles of effective inventory management. This version of the spreadsheet features our newly designed EIM Forecasting-Analysis Spreadsheet that combines the analysis performed by several of our individual spreadsheets into one! It also allows you to perform the analysis for up to 100 items at a time just by loading your data into a single worksheet. Performs forecasting analysis and suggested replenishment on up to 100 items at a time by just loading your data into one single worksheet. In one data entry action, automatically populate data and calculation fields on several worksheets. Compares your current inventory value to an ideal inventory investment. Modify parameters to calculate how much inventory is needed to achieve a desired level of customer service. Price Break with Freight Allowance and Terms Spreadsheet which allows you to consider freight, terms discounts, and extended terms in deciding which of three entered purchase quantities represents your “best buy” quantity. The spreadsheet templates, instructions, and visuals can be delivered to you electronically or by mail on USB drive along with a binder including copies of the spreadsheets and instructions. Order online at the Online Store or you can fax the order form to our secure fax at 972.393.1310. If you have any questions, contact us at 972.304.3325 or email tinasna@effectiveinventory.com. Perform forecasting analysis on up to 100 items at a time by just loading your data into one single worksheet. With one data entry action, automatically populate data and calculation fields on several worksheets. Calculate normal quantity sold/used in one transaction as well as minimum and maximum quantities. If a vendor offers you a lower price per piece for a larger purchase quantity, is it a good deal?This spreadsheet helps you make an intelligent decision. It compares the lower cost per piece to the cost of carrying inventory for a longer period of time. It also takes into account the lower reordering cost per unit resulting from the purchase of larger quantities. The price break that provides the lowest Total Cost/Piece (last column) represents the best buy quantity. Compares the discount you receive to the cost of carrying each purchase quantity for the length of time necessary to sell the entire amount (based on your current overall forecast for the vendor line). The result is a calculation of how much each dollar’s worth of inventory costs when you consider both the discount and the carrying cost. The lower the cost of a dollar’s worth of material, the better the deal. Allows you to consider freight, terms discounts, and extended terms in deciding which of three entered purchase quantities represents your “best buy” quantity. Determines the amount of additional sales your company must generate to make up for the value of material that was lost, stolen, or is otherwise unusable. Each spreadsheet template uses usage and other data you input or download from your computer system to provide you with the guidance you need to maximize the profitability and productivity of your inventory investment. Adapt our formulas into your own spreadsheets or EIM can develop customized spreadsheets to adopt the concepts and principles of effective inventory management to your entire inventory, addressing your organization’s specific needs. Please contact us for more information on how we can customize these spreadsheets for your organization.